Dialogue is typically hailed as a progressive force fostering mutual understanding and resolving conflicts. Can it really carry such a burden? Does dialogue really resolve conflicts? In this unique volume international experts critically assess the political role of dialogue, addressing its potential and limitations. 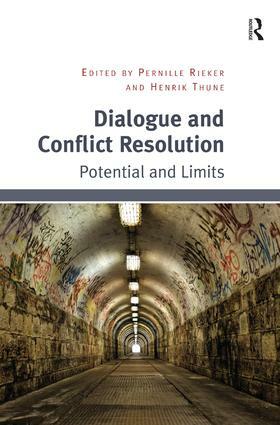 Bringing fascinating insights to bear they examine the theoretical underpinnings and conceptual boundaries of dialogue as a tool for conflict resolution. Major recent crises such as the Russo-Georgian war in 2008, the conflict between Western powers and Gaddafi’s Libya, arguments over Iran’s nuclear programme, religious tensions in Egypt after the Arab Spring, the Afghan case, the Sudanese experience and the recent Russo-Ukraine conflict are all considered and the conflict resolution attempts discussed. Using these cases the contributors explore in depth the nature of the dialogue between the actors, the extent to which it worked and what determined its impact. Pernille Rieker is a Senior Researcher at the Norwegian Institute of International Affairs (NUPI). She holds a doctoral degree from 2004 from the University of Oslo. Her research interests are related to international security, European integration, regional security and external governance as well as national foreign and security policy with a special focus on the Nordic countries and France. From 2005 to 2009 Rieker headed the Department of International Politics at NUPI. She has also worked as a senior advisor at NordForsk (2009-2010). Henrik Thune is a Senior Researcher at the Norwegian Institute of International Affairs (NUPI) and head of its Middle East Programme. He holds PhD and Masters degrees in international relations from the University of Oslo and the London School of Economics and Political Science. Thune has served five years as a diplomat in the Norwegian Ministry of Foreign Affairs, and has lengthy experience of work with peace and reconciliation processes. From 2009 to 2012 he was project manager in the Secretariat of the Norwegian Foreign Minister. Thune is currently conducting research on inter-state relations in the Middle East and Norwegian foreign policy.